Distinguishing Characteristics Caucasian male. Blond hair, blue eyes. During June 2002, Logan, his mother, Katherine L. Rutan, and his four-year-old brother, Justin Daggett, moved in with a roommate, Melody Lennington. Photographs of Rutan are posted below this case summary. She has been married five times and may be referred to in the media by one of her married names. In April that year, the Oklahoma Department of Human Services (DHS) had taken custody of Logan and Justin after Rutan called a crisis hotline and said she was afraid she was going to hurt the children, particularly Logan. The children were returned to her care within a few days, however. Rutan had stated Logan was "dangerous" and she was afraid he would hurt his younger brother. She told multiple people that he had a history of setting fires, and told one witness that if Logan set another fire, she would "be forced to do something to Logan that I don't want to do" in order to protect Justin. Rutan again requested help from the DHS about Logan's alleged fire-setting behavior. A DHS worker Rutan spoke to agreed to place Logan in a children's psychiatric hospital for a series of tests, but the facility didn't have an opening for another four days. Rutan reacted angrily when she learned Logan would not be placed immediately. In spite of his mother's characterization of Logan as "a child murderer and a house burner," the DHS worker who spoke to Rutan and Logan thought he was acting normally and appeared friendly and well-mannered. Lennington last saw Logan on the evening of June 22, when she put the child and his brother to bed. Between 3:00 and 4:00 a.m., Lennington woke up to the sound of Logan screaming and crying. She went back to sleep. At 6:00 a.m. when Lennington got up to go work, she asked Rutan what had happened with Logan. Rutan replied that Logan was sick and she had put him in the basement. Later that day, when asked about Logan, Rutan told her boyfriend and Lennington that DHS had taken him and would place him with his biological father. She had a bruise on her arm, which she said Logan had inflicted when he taken. The DHS had not taken Logan; they were not scheduled to do so until the following day. Witnesses stated Rutan appeared relieved that Logan was gone and attempted to give away his clothing and belongings. Justin told a visitor, "Logan won’t be home anymore." Logan's maternal grandparents reported his disappearance on July 7, after trying to contact Logan and getting evasive answers from his mother as to his whereabouts. She told his grandparents that he was in a residential facility, and they offered to take custody of him, but she refused to tell them what facility he was in. When the police went to question Rutan, she told them Logan was with her brother and that her brother traveled for work and she did not have his contact information. Logan's uncle, however, had not seen the child in over a year. The uncle has cooperated with police and is not considered a suspect in his nephew's disappearance. When authorities searched Rutan and Lennington's home, they found candle wax, bloodstains and masking tape with hairs stuck to it in the basement of the residence. The blood was tested for DNA and was proven to be Logan's. Investigators also found rope, drain cleaner and a large amount of plastic sheeting in Rutan's car. Investigators later learned Rutan had borrowed the plastic and a shovel from her boyfriend, saying she wanted to plant wildflowers, but she never planted any. Police determined that Logan was not enrolled at any of the facilities Rutan had claimed she had placed him in, or with any of the people she had claimed were caring for him. In addition, Rutan asked a male acquaintance to claim he was Rutan's brother and that he had Logan. When authorities interviewed Justin, he told a story of how he, Logan and Rutan had driven out into the country. Logan's skin was white and he wasn't moving. Rutan had a shovel and some plastic. Justin's mother took Logan, the shovel and the plastic away from the car. She told Justin not to get out of the car because there were snakes. When she returned hours later, she was alone, and when Justin asked where Logan was, Rutan reportedly said, "He went to where the bad boys go, and if you ever do anything like he did, you’ll end up in the same place." Rutan. who moved away from Woodward in September 2002, never called the police to inquire as to the status of her son's missing person case. She was arrested on bad check charges in September 2002 and was incarcerated for a time and then released. She hired an attorney and refused to cooperate with the investigation or take a polygraph test. Prior to Logan's disappearance, Rutan had repeatedly said to many people that she didn't want him in her life, saw him as a hindrance and wanted him gone. She reportedly treated Justin well and showed affection for him, but she abused and neglected Logan. After her fourth husband's trailer burned down, she blamed Logan for starting the fire, but there was never any proof that Logan was responsible for it. Various witnesses saw her beat the boy severely and attempt to abandon him, and one of her boyfriends said Rutan had told him said as far back as 1999 that she wished there was some way she could kill her children and get away with it. Earlier in 2002, Rutan had asked her parents to take Logan, but they were unable to do so. 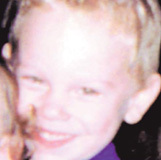 In February 2006, Rutan was charged with first-degree murder in Logan's case. Prosecutors allege she used "unreasonable force" which caused "mortal wounds" to her son. The case against Rutan was mainly circumstantial. Justin testified for the prosecution, as did several of Rutan's former boyfriends. A sanitation worker also testified; he remembered seeing a blue suitcase, wrapped in plastic and tied with rope, out for trash pickup on Rutan's block on the day Logan was last seen. He said the suitcase smelled like something dead and weighed forty to sixty pounds, and a woman watched him put it in the garbage truck. A blue suitcase belonging to Lennington disappeared at about the same time. Rutan was convicted of murder in August 2007. The jury deliberated only two hours before reaching a verdict. They recommended a sentence of life in prison without the possibility of parole. Foul play is suspected in Logan's case due to the circumstances involved. Updated 10 times since October 12, 2004. Last updated January 25, 2019; four pictures added, details of disappearance updated.